PART TWO: Through the desert and into a new year. Having enjoyed a quiet family Christmas at home, riding along the banks of the Thamalakane River with friends, our next adventure was to take us north of the CKGR, to the magnificent Makgadikgadi Salt pans of the Kalahari. Moving horses is always an anxious time, not least when the first load experiences a tyre blow-out en route. Thankfully, our Tyremax friends were on standby and came swiftly to the rescue. In truth, we were not sure what to expect on this safari, given the existing erratic weather patterns. We were pleasantly surprised. We could not have had better guests with which to celebrate the New Year. Not only were this family of Swedes great riders, they were incredible fun, and game for anything. 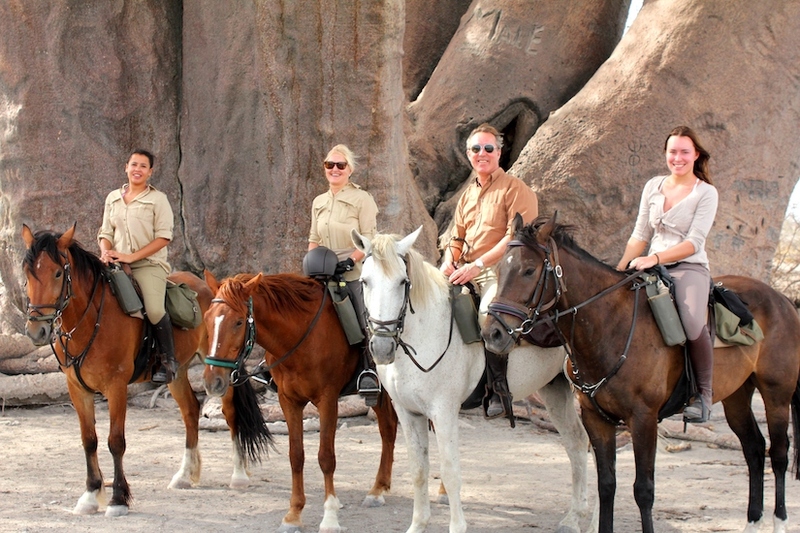 Surprisingly, it was their first time to this part of Africa, and we felt honoured that they had chosen to ride with us. 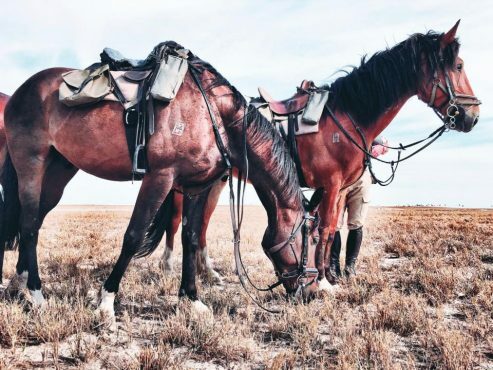 Having done their internet research, it was the wide open spaces of ‘nothing’, expecting the unexpected, and an experienced private guide which cemented their decision to ride with us in the vast expanse of the Kalahari. 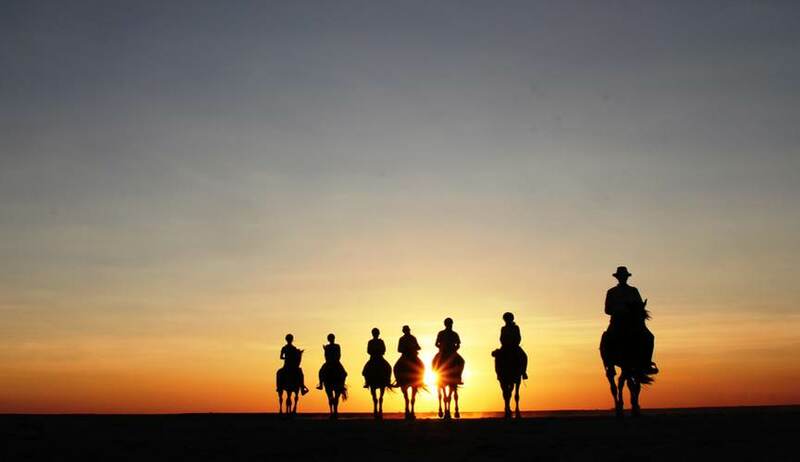 The first two days were spent exploring the surrounds of our base camp and beyond, a practice which makes it easy for riders to identify which horse they are comfortable with, thus forging a mutual bond of trust for the next few days. 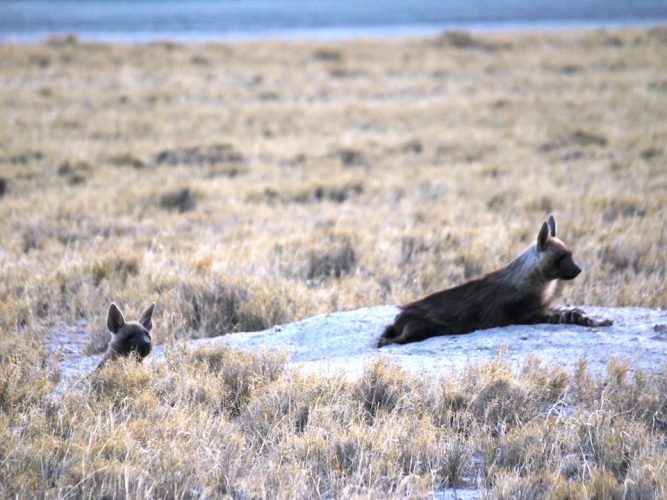 Riders became familiar with the terrain and pace, as well as having the chance to get up close and personal by vehicle with a relaxed family of 3 brown hyena cubs as they ventured out of the safety of their den into the soft haze at dusk. 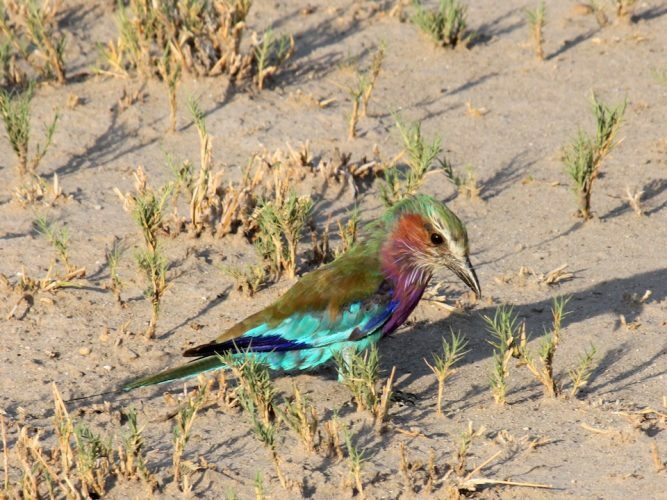 It also provided an opportunity to become aware of the more unusual desert-adapted species unique to this area, amongst which are aardvark, aardwolf, bat eared fox, jackal, caracal, steenbok, ground squirrel, spring hare …. not to mention the birdlife. It is well known that many early explorers, including Livingstone himself, followed routes through this area on their quest northwards. They inevitably used the colossal baobab trees renowned in the area as their GPS markings, and left a trail of historical graffiti carved deep into their peachy bulbous bark as evidence of their passing. James Chapman, one of these adventurous types, had the privilege of having one such giant named after him and it was to this beacon we were heading to on Day 3. A long, challenging ride would take us along this route, visiting Chapman’s and ending up at Greens’ Baobab (named after the Green brothers) for a welcome lunch break set in the shade of a giant Leadwood nearby. What we were not anticipating was to be greeted by a swarm of very thirsty bees on arrival. Recognising that the bees were not hostile, we moved cautiously through them, but it only seemed to encourage their curiosity. Lunch had to be delayed, in spite of our futile attempts to attract them some distance away with a makeshift birdbath filled with water and coca cola. With a couple of inevitable stings here and there, we finally resorted to burning huge piles of remnant dried elephant dung and covering ourselves in cloth kikois. This seemed to work – and we were able to enjoy a delicious, albeit somewhat smoky, Salad Nicoise accompanied by a cheeseboard and an ice cold sauv blanc – before collapsing on our stretcher beds in surrounding shade. Today was Julie’s 16th birthday and it had proved to be a memorable one indeed! (Sadly, we were not to know, but this was the last time we were to see the mighty Chapmans baobab standing proud…..). It took some effort to drag ourselves off the now sweat-saturated stretchers, and back onto our horses, but we were soon heading along the final stretch of our journey that day with a cooler wind on our backs and the sun behind us. The back country on this part of our ride provided us with a vista of gorgeous silky open grassland and acacia belt allowing for some exhilarating long canters whilst chasing our equine shadows as they continued to stretch out ahead of us. We arrived at our fly camp with the last of the sun’s rays creating a backdrop palette of crimson, burnt orange, burgundy, amethyst, indigo and navy that any of the Impressionist artists would have rushed to capture. With horses safely attached to the picket line and suitably watered and fed, we were welcomed by the friendliest of staff with cold flannels and a cooler full of ice cold beers, beverages and wine. This has to be the best gin and tonic served anywhere in the world! ‘Fly’ camp consists of modest (but perfectly adequate) dome tents with comfy stretcher beds complete with linen, bedside table, and personal wash stand and safari chair. It also has its own dining / mess tent and although most dinners are eaten out under the stars, it provides a shady haven at lunch time. But best of all is the open bucket-shower tent. Nothing beats showering under a tree and looking up through the branches at the stars. 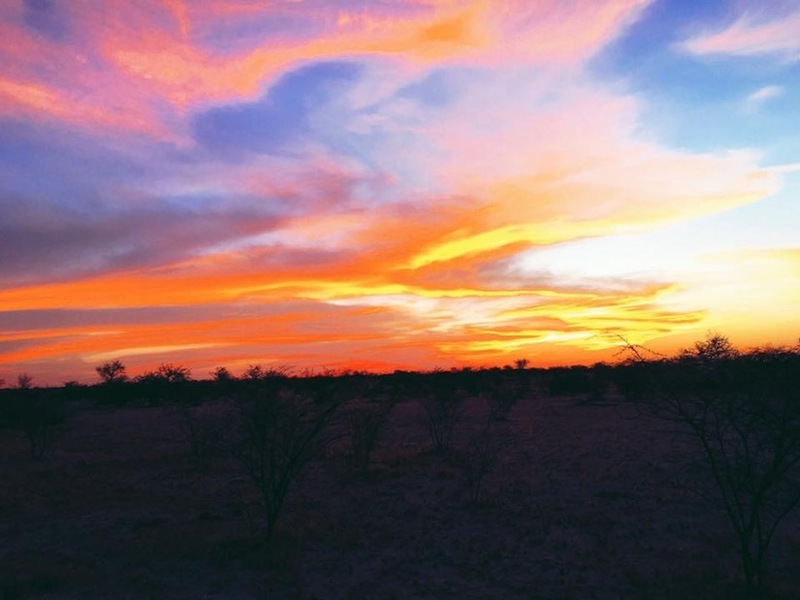 The camp is set up on a rise, or sand ridge, as it is known in a predominantly flat Botswana, in a generous grove of commiphora, and offering the unusual occurrence of a view stretching for miles across the ashen crust of never-ending pan. 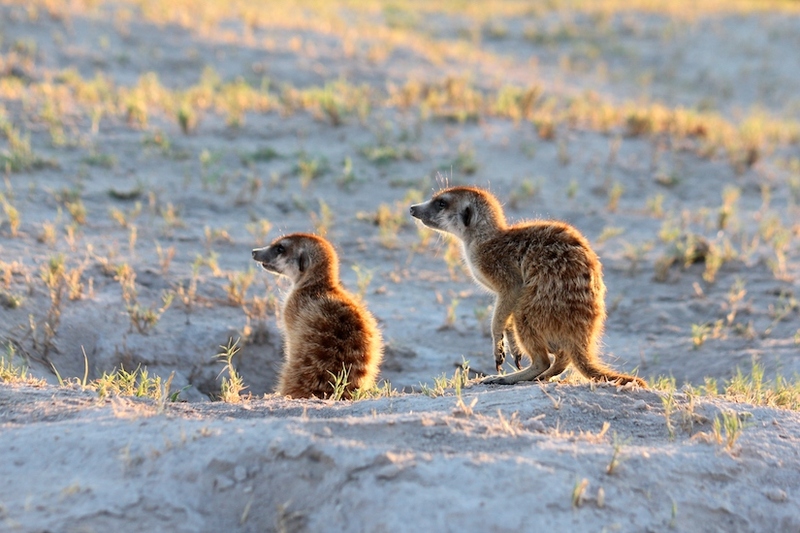 A highlight of fly camping in the Makgadikgadi is the time spent with one of the family groups of habituated meerkats. In order not to disturb their habitat ,nor to frighten them, we dismount some distance from their industrious early morning start and move in quietly on foot. Our meerkat ‘guard’, Brave, has arrived ahead of us, having seen them safely to bed the evening before. He has names for all of them, knowing each of the little carnivores individually; we follow and observe as they dig up and feast on larvae, scorpions, spiders and frogs until the sun is high in the sky and they retreat into the cool sand below ground for the rest of the day. By then the raptors are beginning to circle high above on the swirling thermals and the meerkats need to be out of harm’s way. We head out onto the edge of the pans. “This is a wonderful place to muck about on horses,” Lord Portsmouth recently observed. 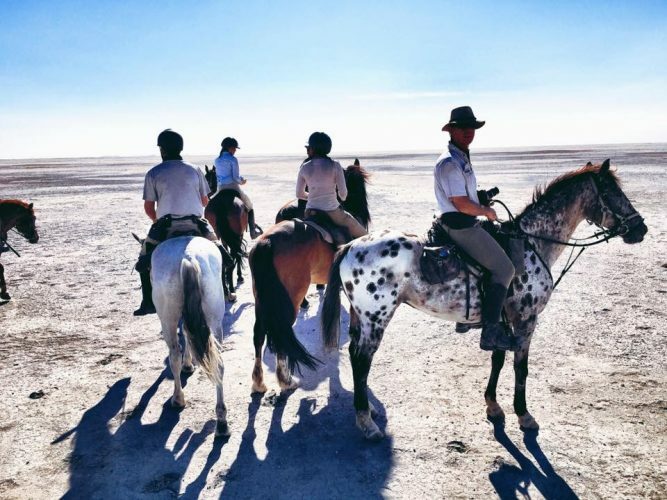 The lunar landscape with its endless horizon and confusing perspective lends for some unique photo opportunities – and we ‘launch’ ourselves into space creating some apparently spectacular dismounts which could not fail to impress the likes of Frankie Detorri. The morning adrenalin rush is concluded with a race across the expanse of the pans to camp. The final afternoon out here is spent absorbing the spectacle of the sunset; it is a peaceful time of quiet reflection – when nothing else seems significant at all. Another early start in the morning with some challenging riding ahead of us so, with sensory overload, we retire early. Picking up the pace (we need to get back to camp before the midday heat), and leaving a drier than usual Sweet Water spring, we are joined by migratory herds of zebra in the distance. They are attracted by the steady drumming of our hooves as we canter across the grass islands. The sense of freedom and exhilaration as we merge and detach from our mounts’ stripy cousins in a unified rhythm is hard to describe. And it is with some reluctance that we finally find ourselves back at Camp Kalahari – weary, but invigorated by an enormous sense of achievement. Our afternoon game drive is initially quiet and subdued , but the tell-tale sign of trees heavy with vultures indicates that this is about to change. It is not long before we find two female lionesses with their young cubs feasting on a carcass of a cow, no doubt from a nearby cattle post. We follow them as they make their way to the nearest waterhole where they appear oblivious to the hundreds of quelea swirling around them – these in turn being hunted by lanner falcons and tawny eagles. It is New Year’s Eve and our hosts have prepared a table fit for a king. Bubbles are on ice and the stars are surely brighter than normal? With much laughter we toast the new year in before tumbling into bed, oblivious to the six bull elephants who have made their way into camp and are quietly enjoying the fruit of the Mokolwane palms around us. A visit to the Kalahari is not complete without some interaction with Africa’s First People – the San Bushmen. Our guests have the privilege of spending an enlightening morning walking with these gentle little people of the earth as they humbly present the remnants of their ancient civilization in as genuine a way as they can. They are fiercely proud of their culture and have retained much of their wisdom and many of their traditions. It is with an inexplicable sense of sadness that this safari draws to a close; the desert has, once again, left its indelible mark on us all.